For Brayden Friesen, a trombone student of The Glenn Gould School, the 2019 Juno Awards were a family celebration. He travelled to the ceremony to celebrate his mother, Kim Hastings, who was named Canada’s top music teacher. Hastings received the MusiCounts Teacher of the Year Award, presented annually to an educator who strives to preserve music education in their community. 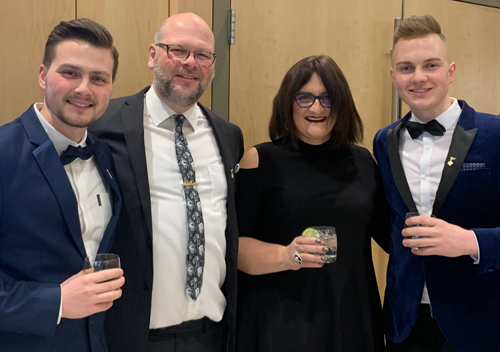 Brayden Friesen, Mark Friesen, Kim Hastings, and Carter Friesen at the 2019 Juno Awards Gala. Given Hastings’ dedication to music education, she is understandably proud to see both Brayden and her younger son Carter pursue careers in music. It was Brayden’s experience as a music student in Toronto – including his time at The Glenn Gould School – that ultimately inspired him to pursue performance as his calling. Among those achievements was the opportunity to perform with the TSO – his debut – when Wolfe was unexpectedly unable to play. Hastings is undeniably proud of her son’s successes as a musician, though she never loses sight of the impact music education has on individuals regardless of the career they pursue. To find a music teacher near you, visit The Royal Conservatory’s National Music Teacher Directory. Support The Glenn Gould School by contributing to Resounding! The Campaign for The Royal Conservatory. To learn more or to donate, visit rcmusic.com/resounding. The Glenn Gould School is supported by funding from the Department of Canadian Heritage through the Canada Arts Training Fund, and from the Ontario Arts Council.